To All Appearance, Dead, by Liz Filleul | So This is School! In a trembling voice, she informed them all that she’d just received a phone call saying that Valerie had died on her way to the hospital. The time is the twenty-first century, the place, Cotterford Manor in Warwickshire. And the event is ‘Tales Out Of School’, a conference dedicated to Girls’ Own literature and school stories. To All Appearance, Dead isn’t itself a Girls’ Own book, but it’s set firmly in the world of fans and collectors, and readers who are part of that exclusive world will enjoy Liz Filleul’s gentle sending up of the enthusiasms and traditions of Girls’ Own fans. Sally Meredith, a dedicated fan and editor of Australian Collector, finds herself at ‘Tales Out of School’ with a couple of interviews to conduct for her magazine and the rest of the time to enjoy for herself. But when abrasive book dealer Valerie Teague is taken ill in the middle of the folk dancing evening and later dies in hospital, Sally starts investigating her death and soon finds herself in the middle of an intriguing puzzle. To All Appearance, Dead is a slow-paced read with a plot that’s complex enough to hold the interest and a continual stream of thoroughly enjoyable Girls’ Own references. In fact, the whole flavour of the book is rather old-fashioned, with a strong hint of Girls’ Own: ‘I say, Sally, do you fancy a drink after supper?’ asks Richard (the sole significant male character). 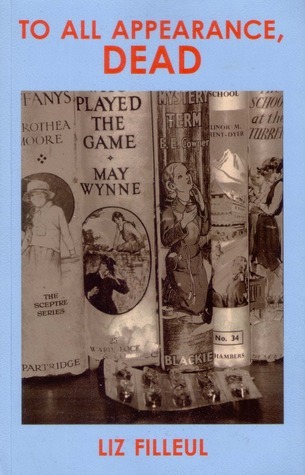 And while Girls’ Own books very rarely deal with murder, the way Sally rushes around investigating Valerie’s death is strongly reminiscent of the schoolgirl hunting for the secret passage with only the most flimsy of clues to help her, while Sally herself faces a similar lack of danger to any Girls’ Own heroine single-handedly capturing some unlucky burglar.Despite the gentle enjoyability of the book, I found myself disappointed in it. After pondering over this for a while, I realised that while the plot and even the writing (though it could do with some stringent editing) are excellent, the characters fell far short of what they could have been, and for me it has always been the characters that make a book. Sally, the heroine, is quite likeable, but she has few distinguishing characteristics and none of those interesting flaws that make for a heroine one can really connect with. The victim, Valerie Teague, is precisely the opposite and seems to have no sympathetic traits whatsoever. The back-up cast is, in general, flat and uninteresting, while the policemen are frankly ridiculous. The character for whom I felt most sympathy was Margaret. When we first meet her, she is quiet and mostly remains in the background. Subsequently there are a number of fairly obvious references to Margaret wearing long sleeves in the hot weather, which means it doesn’t come as much of a surprise when she admits to Sally that she self-harms. This plays an important part in the book’s plot but it also seems to become Margaret’s overriding characteristic, so that the discovery of other antisocial and even criminal behaviour seems simply an addition to the self-harm and apparently causes very little surprise. It isn’t, of course, uncommon for people to turn out very different from the way one perceives them on first acquaintance, but I felt that Margaret’s character wasn’t explored as deeply as it could have been, with the result that it all feels very superficial and disappointing. Unfortunately most of the characters suffer from this lack of attention. One of the standard components of a novel is supposed to be character development, but I didn’t feel that a single character in To All Appearance, Dead really changed as a result of their experiences. Sally doesn’t seem to become emotionally involved with her investigation and we rarely experience her thoughts or reactions, which means that it’s difficult for us to know how she is feeling. Most of the characters disappear as soon as their function in the plot has been fulfilled, and a number of people’s stories are left oddly incomplete, including Margaret’s. I found this particularly frustrating because up until that point she had played an important part in the story and I felt that she and Sally had developed a relationship, which simply fell, unacknowledged, by the wayside. Having said all that, I did enjoy reading To All Appearance, Dead. It was a cosy, amusing story with a reasonable plot and numerous pleasing Girls’ Own references, and I think most Girls’ Own fans will like it for the engaging and recognisable world that Liz Filleul skilfully builds. It could have benefited from some rigorous editing and some hard work with the characters, but on the whole, I recommend it as a light, entertaining read.